The highs and lows of the highs and lows. I feel like my epic mountain rides take a similar path or trajectory. The day starts with an appropriately mountainous breakfast, the kind where I fuel for a big day ahead. A bowl of cereal, followed by a full English breakfast and a couple of rounds of toast. While eating all this I’m thinking “Oh my god I better have a decent ride now I’ve eaten this much food!“. 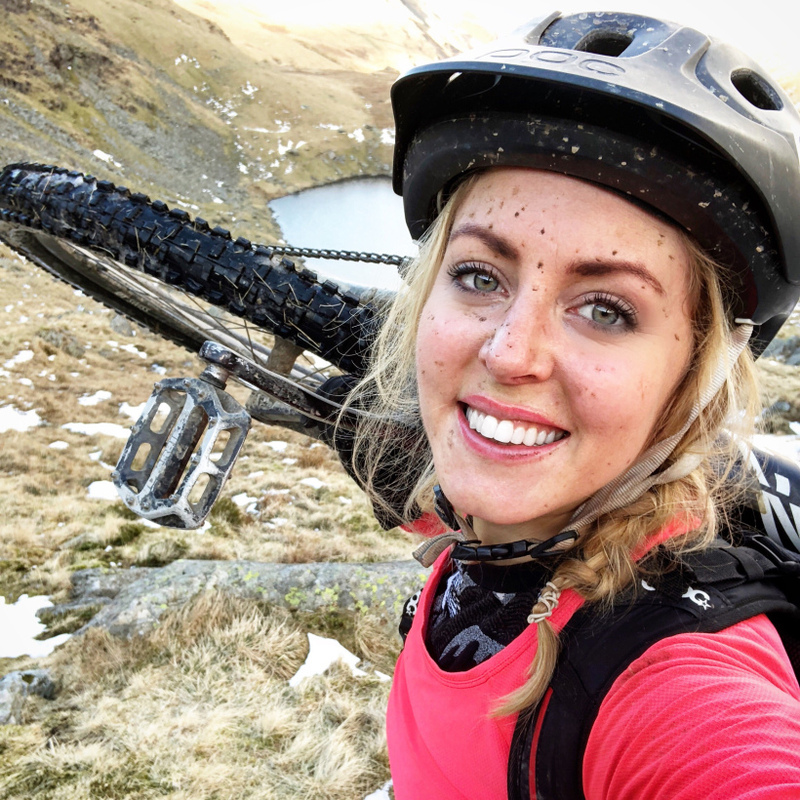 Then follows a ‘carb-coma’ where I have no energy and feel really sluggish, almost sleepy as I attempt to yank on my knee pads, thinking to myself “I don’t even have the energy to get all my gear on, let alone do a minimum 1000 metres of climbing!” After the initial “can I just go back to bed?“. feeling has subsided I get on the bike and set off. My legs always feel tired at the start of the ride. I call this the ‘waking up my legs phase’. Then I get all excited and start taking photos of EVERYTHING. As soon as I get into the countryside with wide open views, something within me just ignites and I feel so alive, like I have found my purpose. It’s such an incredible feeling of peace and happiness. It’s the feeling I always want to live over and over again. To me, the gnarly trees, beautiful winding stone walls, rivers, sheep and wildlife all look more vivid and special against the backdrop of a magnificent mountain or valley expanse. I’m soaking it all in and I’m loving the freedom. Then the ride begins to get more technical and I start to think “I’m gonna have to crack on or this ride will finish in the dark!“. The middle section is fun, my energy levels are good, the climbs are a challenge, the downhills are adrenaline fuelled and I’m feeling good. Following this generally comes a section that is a LOT more challenging than I was expecting it to be. The tough technical climbs become too difficult for me to tackle on the bike without exhausting myself totally trying. This tends to be the ‘hike-a-bike’ phase: because the terrain is so tough you simply can’t ride it. The best way is to throw the bike over your head, so the down tube rests across your shoulders. This spreads the load and although the bike weighs around 15kg its initially easier to hike with the bike rather than lifting and wheeling your bike over rocks on a steep incline. Finding your balance is critical. On the last couple of rides the hike a bike phase has taken me up snow-covered mountain passes, where the ice and snow has made the climbing more tricky than usual. Both arms are needed to support the bike so that it rests equally, which means you have to be extremely deliberate how to plant each foot before making the step. I gradually start to feel my back and shoulders aching as bike bits dig in to me, but it’s essential to press on. A lot of thinking time happens in the hike-a-bike phase. I’ve mentioned before that I count my pedals when I’m climbing and this happens to when I’m walking. I go through by counting each step pointlessly as a way of keeping my motivation up and my mind focused. It’s at this stage when doubt creeps in. The voices in my head urge me to throw the bike down and rest (not an option!) or to start some sort of “I give up” hissy fit… (again…pointless) I also start panicking about whether we have been stupid in thinking we could take on such a challenge, questioning our fitness levels and if we will need to call the mountain rescue. The hike-a-bike section is so hard going, mentally and physically. On the last ride (in my head while trudging along) I compared it to childbirth (not that I would know). The suffering is so big, yet the moment you reach the top or start to go back down, it is instantly forgotten. All the pain disappears and you just forget how tough the past hour has been. So yeah, after the really, really hard bit usually follows an incredible descent. The type that blows your mind in terms of the challenge, the views, the adrenaline, while filling you with fear and exhilaration in equal measure. It feels surreal as you try to soak up the experience and lock the feelings into the memory bank for times when you need to feel motivated and inspired by the pursuit you so enjoy. I have described in previous posts that I talk to myself when I’m riding. I find it calms me down and helps me deal with the technical riding, as though it is someone else giving me the commands rather than me reminding me of what I need to do to ride my best. There’s so much to take in during those amazing, fast paced downhill sections. Having a word in my own ear I have found to be the best way for me to make everything feel real and to enjoy the moment! After the awesome descent I tend to be buzzing, and it’s pretty common for me to be doing some whooping and high fiving, along with repeatedly going “that was SO fun!’ Debriefing/deconstructing the downhill section by section in fast chit chat with fellow riders is a bit I really look forward to. I also like the feeling of knowing you have conquered the toughest challenges so you can relax a bit. At this point I start to feel thirsty for a nice big cold glass of shandy! The ride finishes and I am battered and weary, plus aching knees and with a good sense of relief. At the end I am always a shell of a human being compared to the bright eyed and excited person I was around 5 hours before in the earlier stages of the ride. One of my favourite things to do is then go to a nice country pub and have some good food whilst looking over the photos and chatting about what an incredible experience it was. The feeling of pulling off the knee pads and taking off the helmet is heaven. One thing that makes me laugh is the internal conversation I always seem to have with myself, where I vow not to take on a ride so long or so difficult again, whilst also knowing that I definitely WILL do it all over again and it will probably be even more extreme than the last! Climbing Over 95,000 Feet, at Four Years Old..